No, it’s not as simple as signing up for an account with Google’s Gmail or Yahoo! Mail. Getting an email hosting package is considerably different. Doing so, by the way, is a justifiable action. You would get an email hosting package so you can have your own custom email for your business or professional services. It somewhat creates added credibility and authority using an email address with a suffix that is your domain name instead of something like @gmail.com or @yahoo.com. ●	By getting it as part of your web hosting package. You can get UK web hosting package that includes free email with it. This free email with your web hosting package, however, is usually limited in terms of the number of accounts you can create and the storage. Usually, the storage is only around a hundred to a few hundreds of MB. ●	By Managing your own in-house email servers. Running your own email server is comparable to setting up your own web host but is a little more complicated. This post is mostly about the first two options. If you are interested in operating your own email server, you can look for other references or guides online. The goal is here is mainly to get you acquainted with the basics of a getting a UK email hosting package so that you can send and receive emails with an email address that bears your own domain name and lets you be in full control. ●	Choose a host with UK based servers. Just like in hosting websites, the location of the web server matters. You can more easily access your email server if it is located near your location. ●	Make sure the web host offers solutions for email spam. Generally, it should be unnecessary for you spend more to on spam filtering. Most hosting companies should readily provide spam filtering solutions with their hosting services. Pick the one deemed most effective in dealing with spam. ●	Email forwarding may be necessary. Email forwarding is basically the automatic sending of a copy of an email that goes into your inbox into another account. For example, if you own both 1@email.com and 2@email.com, you can set 1@email.com to receive the emails that goes to 2@email.com. You can forward emails from multiple email accounts to one account. Gmail has this email forwarding feature. ●	You may need the ability to create mailing lists. Mailing lists are a must for companies that have several departments or team silos. Mailing lists speed up the delivery of emails to the intended recipients. ●	Autoresponders could be advantageous for you. Autoresponders enable the automatic sending of drafted emails in response to specific queries. Autoresponders are triggered either through keywords or by the mere receipt of an email in a specific email address. ●	If you choose email hosting that comes for free with your web hosting, see to it that there’s an option for an affordable upgrading to increase the number of email accounts you can create and raise storage limits. Email hosting services in general as provided by web hosting companies. You will very rarely find companies that solely offer email hosting. 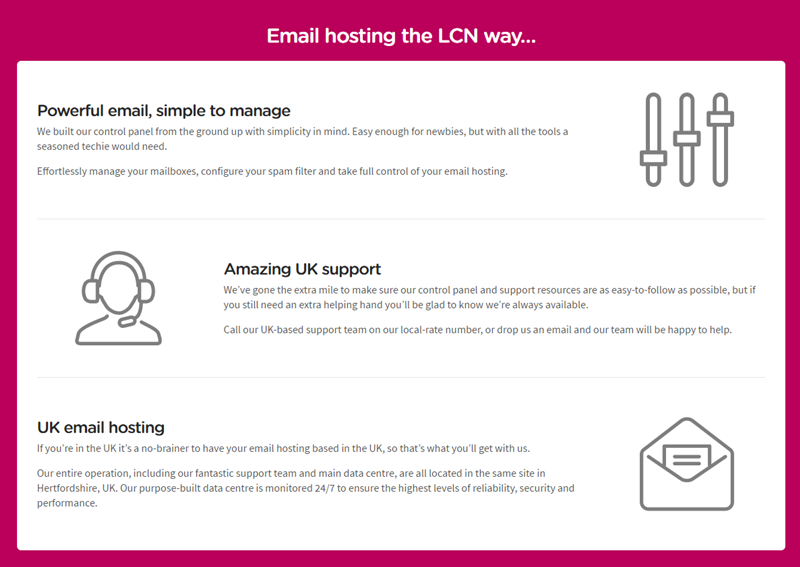 As such, if you are looking for a good UK email hosting service, your choices are basically the different web hosting companies that specialize in providing hosting solutions to those who are in the UK. Customer Service. Lastly, you need to ascertain that you will be getting good customer support or customer service from the company you choose. Your inquiries should be promptly responded and complaints competently addressed. Reliability. Make sure that the company you choose has a solid track record of good service quality. Availability should not be lower down 99% or downtimes should not exceed 1%. You certainly don’t want a server downtime to make it impossible to use your email during a critical moment. Security. The security of your email host is non-negotiable. The company responsible for it should have an unassailable record of defending client accounts from various cyberthreats. It should be using updated software and up-to-date hardware. UK-based Servers. As mentioned earlier, it’s important for the hosting service provider to have UK servers to ensure the fastest possible connections. Affordability. Definitely, price matters so it’s important to properly do your research and comparisons to get the best bang for your buck. To find a good UK email hosting service company, you can go over reviews and rankings presented online. You can also ask for recommendations from those you know who have already tried using email hosting services. Just make sure you don’t get misled by fake reviews and rankings. Always verify the information you find online. Before ending this post, just to make things clear, the idea of getting a UK email hosting package as discussed here, does not necessarily mean that you are going to have an email address with a domain name that ends with .uk, .co.uk, or other TLDs that are associated with the UK. It is about getting an email hosting package that will be mainly used in the UK.